Flowers, herbs and spices have been used for thousands of years to add fragrance to our homes. From the earliest writings we have found evidence of the important various scents have played in our history. We can’t at all pout 18 inches of rose petals down in our homes the way Cleopatra did for Mark Antony, but we can enjoy that wonderful aroma just the same. The Romans used lavender to add fragrance to their linens. 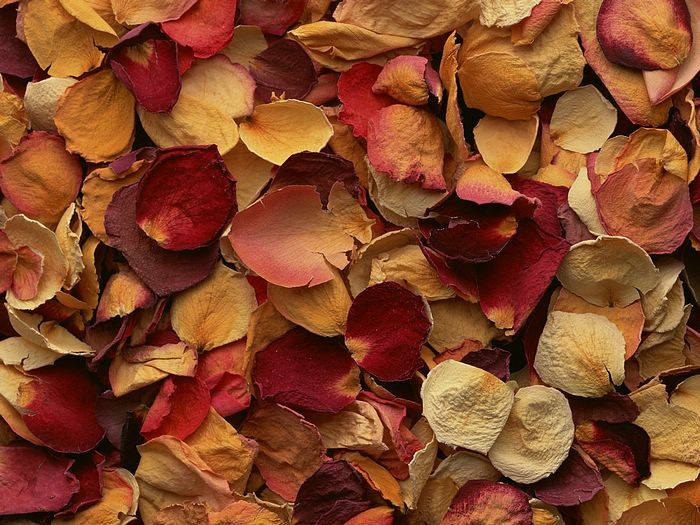 Rose petals were used to stuff their pillows and mattresses. In later times, Lady’s bedstraw would replace the petals. Hops were added which helped to induce sleep as well as soften the bed. During Medieval days, fragrant flowers and herbs were strewn about the floor to release their scent when stepped upon. During those times of few baths, and fewer launderings, people carried small nosegays of fragrant herbs to help allay the odors. The mixing of special potpourri blends became something Victorian ladies delighted in creating. Today we are seeing a return to this desire for fragrance, both subtle and exotic. 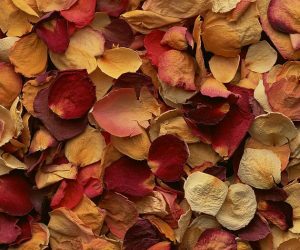 Potpourri can be a simple mix of lavender and roses, or a more complex blending of flowers, woods, leaves and fixatives. The word potpourri means “rotten pot”. Sounds delightful doesn’t it? This word came about because original blends were bruised rose petals, layered with salt, and left to age in a covered jar. When they were opened, the essence filled the air with the smell of roses and potpourri was born. You can make potpourri by blending together 2 to 3 cups of dried flowers, roots and leaves (use herbs and flowers), 2 to 3 tablespoons crushed cinnamon, star anise and cloves, 1/4 cup dried orange or lemon peel, 2 tablespoons of a fixative (more later) and 5 or 6 drops of an essential oil. Be sure to add lots of dried flowers for color and maybe some pine cones or exotic looking pods. I like to add the essential oil to the fixative and allow that to blend and age for about 4 weeks. Then I mix this into the flowers, leaves, cones, etc. By doing this, the fixative has time to really absorb the aroma of the oil. You will find the aroma will be longer lasting. If you are in a hurry, you can mix everything together and achieve a very satisfactory fragrance. About fixatives, those ingredients that “fix” the aroma. This is a substance which is used to make the scent last longer. They come in many forms, liquid, dried, and powdered. Some of the more common ones are orris root, calamus root, frankincense, patchouli and oakmoss. Many people are allergic to orris root so you might want to avoid using it in your blends. There are new fixatives on the market made from corn cobs which seem to cause no problems for sensitive individuals. You can also use pine cones, cedar shavings and cinnamon sticks. Even dried hibiscus flowers makes great fixatives. Just place them in a jar, add the essential oil and cover. Allow them to steep for several days before adding to your blended flowers and cones. Mix all ingredients together and allow to steep for several weeks in a covered jar. This recipe does not need essential oil. Use 1/2 cup each of whole allspice, dried lemon thyme, star anise, whole cloves, crushed cinnamon sticks, dried orange and lemon peels. Mix well and add 1 to 2 table spoons to your simmering pot. Or, buy large tea bags and fill with potpourri. Place in water in the pot. Saves a lot of messy clean up time. Experiment , get creative and have fun making your own potpourri blends. Oh, and don’t forget to think Herbs! !